• Sharjah’s International Book Fair, October 26 to November 6, emphasizes collaboration with western publishers. • Several new awards were bestowed at this year’s Fair to highlight excellence in English-language publishing. SHARJAH, UAE: It was a good day for Chicago at the Sharjah International Book Fair’s inaugural international awards, presented by His Highness Sheik Dr. Sultan bin Mohammed Al Qasimi at the fair’s opening ceremony on Tuesday this week. Chicago companies collected prizes for Best English Language Bestseller -– Piracy: The Intellectual Property Wars from Gutenberg to Gates, by Adrian Johns, published by University of Chicago Press (UCP) –- and Best English Language Children’s Book, which went to How Many Donkeys? An Arabic Counting Tale, by Margaret Read MacDonald and Nadia Jameel Taibah, published by Chicago-based Albert Whitman & Company. The Koran statuette trophies and checks for $2,500 were collected by Saleem Dhamee, UCP’s International Sales Manager, and Albert Whitman’s President, John Quattrocchi. A third award, for Best English Language Business Book, went to Stalking the Black Swan: Research and Decision Making in a World of Extreme Volatility, by Kenneth Posner, published by Columbia University Press –- clearly not a Chicago company, but the city can take some reflected glory since CUP’s Publicity Director, Meredith Howard, who collected the trophy, originally hails from there. These awards are another example of just how much the SIBF is reaching out to western publishers, backed, as always, by Sheik Sultan Al Qasimi, whose love of books well known and zeal to establish Sharjah as the cultural centre of the UAE is a personal priority. 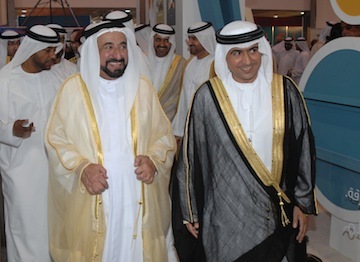 His Highness Sheikh Dr. Sultan bin Mohammed Al Qasimi (on left) with SIBF Director Ahmed Al Amri, on walkabout on the opening day of the Fair on Tuesday. This year the fair invited largest ever international delegation and hosted more seminars and discussions than ever before. UK publishers on hand included Bloomsbury CEO Nigel Newton and his Digital Media Director Stephanie Duncan, as well as a trio from Orion -– Deputy CEO Malcolm Edwards, Paperback Publisher Susan Lamb and Trade MD Lisa Milton. The two houses had specific reasons for being here: Bloomsbury is publishing Sheik Sultan’s memoirs, My Early Life and Orion has signed a deal with Sharjah-based children’s publisher Kalimat to publish one of its titles in English. Also from London came HarperCollins Sales and Marketing Director David Roche, London Book Fair Director Alistair Burtenshaw, BBC Radio 4’s Arts Correspondent Rebecca Jones and Andrew Senior, who established the British Council’s Creative Economy Unit and is now a freelance consultant for creative economies and entrepreneurship. There were more authors than ever before too –- controversial revisionist historian Gavin Menzies, the Lebanese-Iraqi writer Tamara Chalabi, the graphic novelist Ed Hillyer, the cookery writer Sally Bee and the book trade commentator Nick Clee, whose equine biography Eclipse will surely be of interest to Sheik Sultan who famously owns racehorses himself. There is clearly a desire for books if they are put in front of people, as the groups of children crowding some of the stands demonstrated. The fair is full of memorable images –- Arab schoolboys holding hands as they enjoy a morning off school to walk the aisles; parents pushing shopping trolleys piled high with books as if they are groceries –- and one leaves it with that feeling of warmth that can so often seem like the international book world’s trademark. And a glance at the books on display shows that some of the cultural differences between the Arab world and the west aren’t as vast as me might think: “Msass dema” are as popular in Sharjah as they are at home. “Msass” means “drink” and “dema” means blood. Yes, Stephenie Meyer does the business here too. DISCUSS: Can You Have Too Many Book Awards?